Identification status: high confidence. Although it would be nice to see some flowers or acorns to really confirm the determination, there is a voucher of this species from this same location. Identifying oaks in the Grand Canyon is a piece of cake compared to identifying oaks in California. 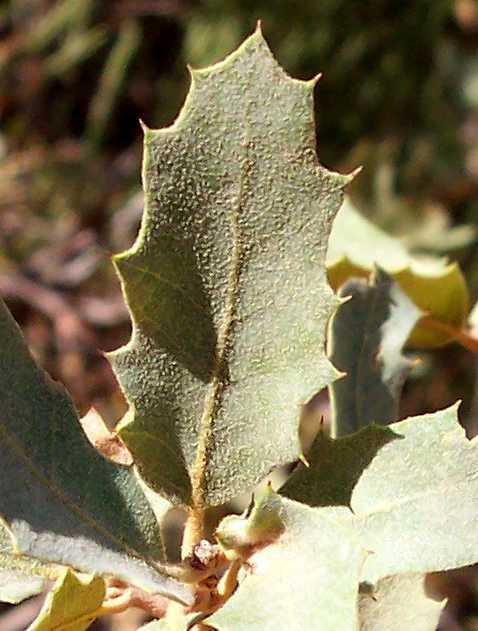 If you see an oak at the Grand Canyon with leaves that don't have any significant lobes and that have many spiny-tipped teeth, you're looking at shrub live oak, Quercus turbinella. Compare the pictures of the leaves on this page to those of Q. gambelii on this same trail. 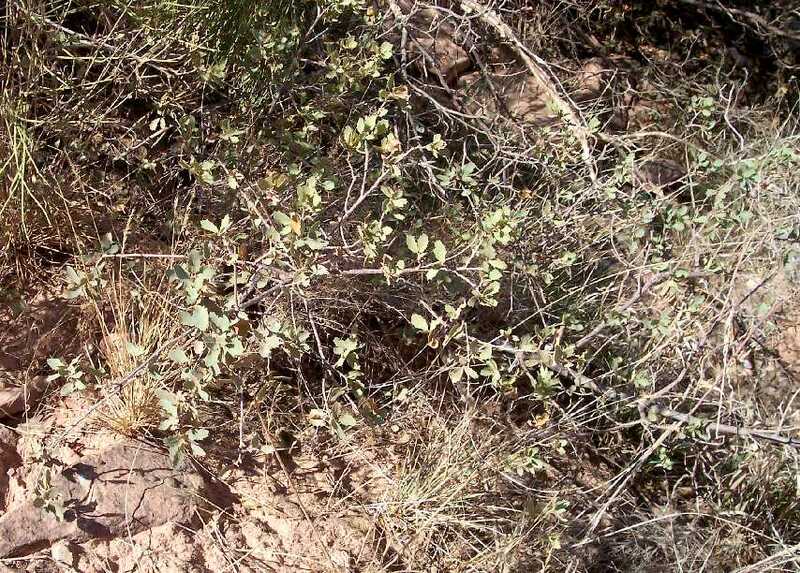 Q. undulata is not given as a taxon in the Flora of North America treatment, since it is thought to be a complex of hybrids of Q. gambelii with whatever scrub oak is found in its vicinity. 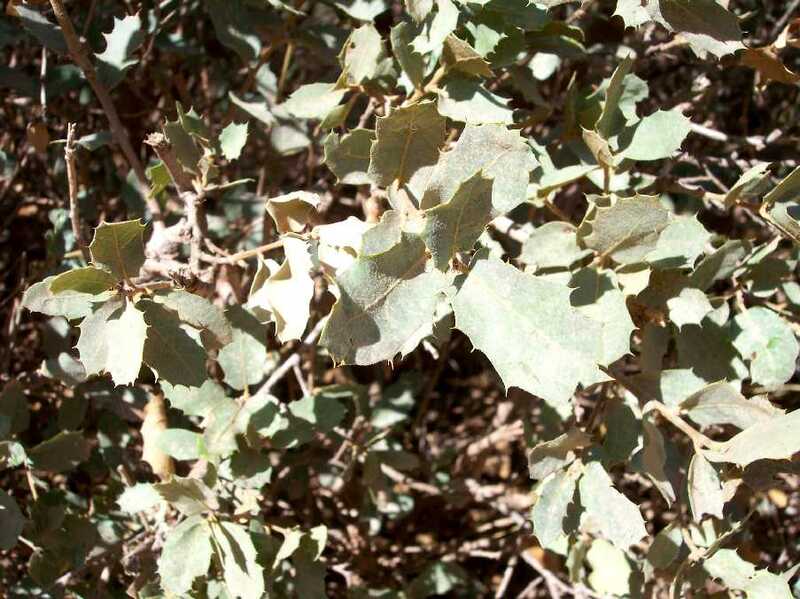 In the Grand Canyon, the scrub oak parent is thought to be Q. turbinella. You can see just from the above key that Q. undulata has leaves intermediate between those two putative parent species. In the current Park Checklist, Q. undulata is called Q. X pauciloba (Q. gambelii X Q. turbinella). However, such plants are not thought to be direct hybrids, but are instead thought to be a hybrid swarm, the result of hybrids backcrossing with the parents to form a complex with variable features that form a continuum from one parent species to the other. 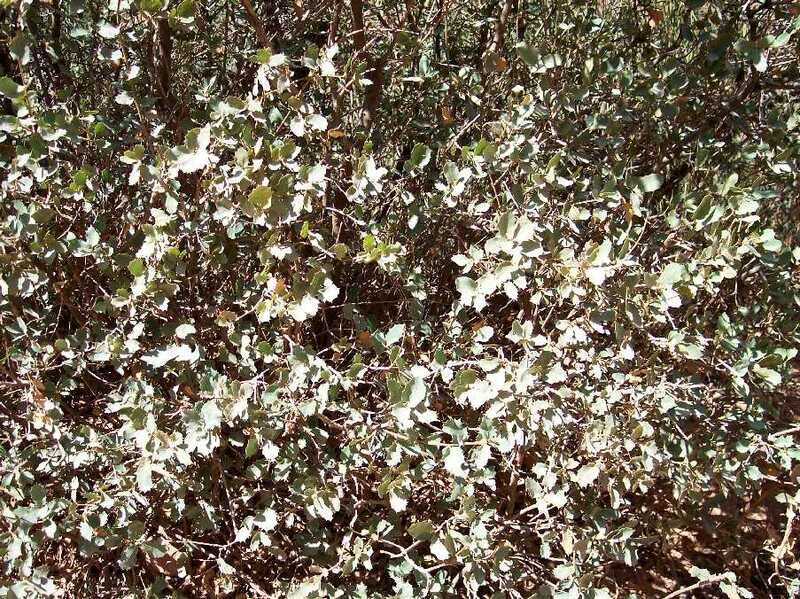 Furthermore, the name Q. undulata has been applied to hybrids of six different scrub oak species with Q. gambelii! Note carefully the words putative and thought to be above; we are still learning about oak species, and they probably have some surprises in store for us, possibly even here. However, oak hybrids rarely get any clearer than the intermediate leaves of Q. undulata here, so the words may just prove to be unnecessary cautions. But until someone has crossed the two parents and described the result, one needs to use the word putative. I look forward to seeing my first specimen of this putative hybrid. 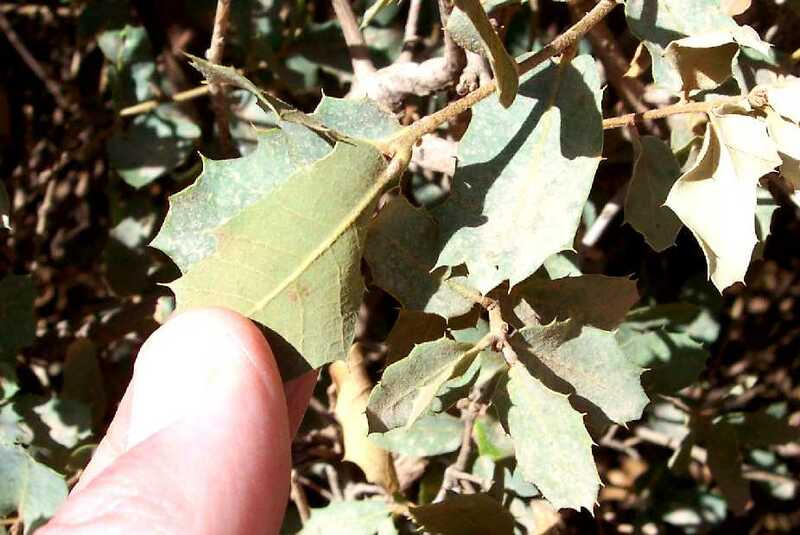 Quercus turbinella is of interest to southern California botanists because two of our species of scrub oaks (Q. cornelius-mulleri, Q. john-tuckeri) were confused with it until about 1980. The specimens of Q. turbinella on this trail were instantly recognizable to me as being similar to those two species in habit and leaves, except that the leaves weren't nearly as hairy underneath. The main difference, which I couldn't observe in 2007 due to the lack of acorns due to the drought, is on the length of the peduncle (=stalk below the acorns), with Q. turbinella having a much-longer peduncle. 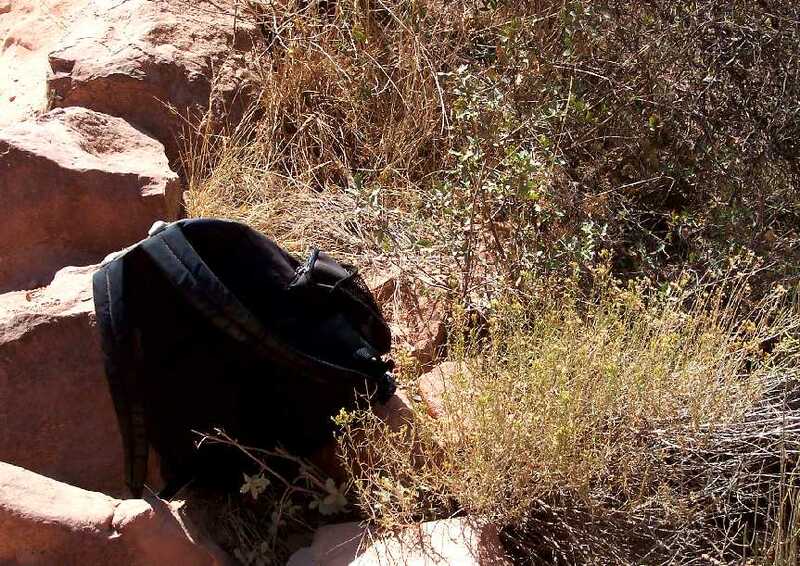 From a SEINet search on 28 September 2007, there are 25 vouchers of this species from the Coconino County portion of the Grand Canyon, including one from this trail at exactly the location of the first specimen in the plant trail guide. (Note that the reported elevation of that voucher is off by 500 feet; mile 2.6 is at 5000 feet elevation, not 5500 feet elevation.) Note that there may be additional vouchers at other herbaria not available through SEINet. 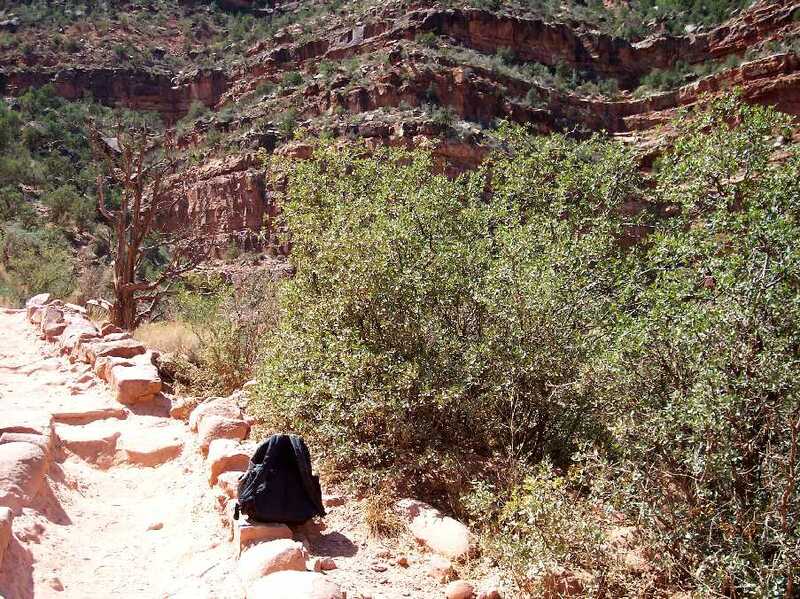 First occurrence on Bright Angel Trail: mile 2.64, elevation 5009 feet (1527 m). Number of plants along Trail: at least 20 plants were found in at least 2 different locations in September 2007. The first specimens on the trail are much shorter than typical specimens. 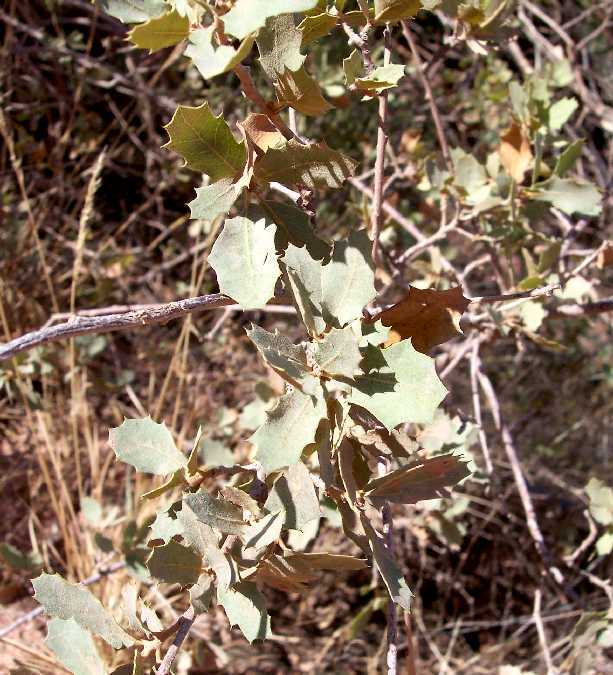 The scrub oak is not the yellow-green specimen in the front; it is the sparsely-leafy specimen behind it with gray-green leaves, shown in closer shots in the succeeding pictures. Note the spiny-tipped teeth and the scattered hairs on the leaf upper surface in the next picture.